Please Watch this video to see what a day in the life of someone with Autism would be like! 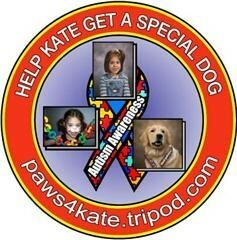 WATCH A VIDEO ABOUT MY QUEST FOR AN AUTISM SERVICE DOG! sometimes when I am in the mall and there is alot of stimulation I don't know what to do and I panic and have melt downs I cry, scream, hold my ears, or I run away from mom and hide .. If the fire alarm goes off at night in our house ... I hide!... I have been hit by a car because I have jumped out our van when mom came to a stop... I am fast and mom just couldn't catch me in time .. I am ok now! I have fallen off the edge of a pool .. good thing my aunt Beatrice is a very fast life guard and I had great supervision that day but, again they were just not fast enough. One day I was walking to school and a snow plow came up the road from behind me and scared me and I didn't know what to do ... so I just squatted down in front of it with my hands over my ears ... it is a good thing that the snow plow driver was watching out for children that day ... he helped me move to a safer place... now I take the H.O.P.E. Van to goto school so I can be safe. I have climbed a wall leading to the roof at school and I fell off ... boy did that ever hurt! .. My PSA was not with me at that moment ... I am ok now! My Favorite foods are corn chowder ... grapes ... candy of course! My favorite friend is my baby brother Josh. He has autsim just like me. I run in the road without fear.. I ran one time and slipped on ice and bumped off the bumper of a van coming to a stop... I was ok a bit scrapped up but I could have gotten hurt much worse. I have walked off the edge of a pool.. I have squatted motionless in front of a moving snow plow with my hands over my ears. I have snuck out of the house in the middle of the night while it was snowing very hard. In just a pair of crocs and pj's. When I was found 3 hours later I was very cold and didn't realize it.We have alarms on our doors but i learnt how to shut them off while people are sleeping. He will be trained so if I wander from mom he will be able to help find me. He will be harnessed to me and is trained to not allow me to run into the road. But, I am taught that I am harnessed to him to keep him safe! He is trained to interupt any behaviors such as flapping my hands when I get scared and he will love me and calm me down with gentle nudges. He will help mom find me if I hide during a fire alarm. He will not allow me to climb to high points. He will Bark if he thinks I am in Danger. My mom always watches me but sometimes if she is not looking I am sneaky. He will LOVE me unconditionally and I don't have to be anyone else but ME! BUT, MOST OF ALL HE WILL BE MY GUARDIAN ANGEL AND I WILL BE HIS!